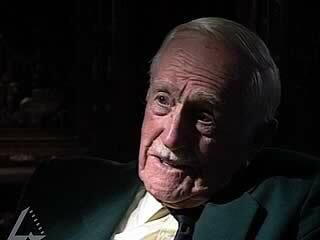 Video clip synopsis – A World War 1 digger reflects on his work as a runner in the trenches at Gallipoli. Hopping across the trenches in full view of the Turkish snipers, the average life of a runner was 24 hours. Broadband MP4 hazlitt_bb.mp4 (5.5MB), suitable for iPods and computer downloads. Jack Hazlitt – World War 1 Digger is an excerpt from the program Jack Hazlitt (26 mins), an episode of Australian Biography Series 1 (7×26 mins), produced in 1991. Jack Hazlitt: Born in Melbourne in 1897, Jack Hazlitt could be described as a “survivor’s survivor”. When war broke out in 1914, Jack lied about his age and enlisted in the Australian Infantry Forces. He survived the war, serving at Gallipoli and in France and Belgium. Jack Hazlitt was a daredevil, the archetypal Australian of a past era. His interview for Australian Biography was his last. He died in 1993, aged 96. Australian Biography Series 1: The Australian Biography series profiles some of the most extraordinary Australians of our time. Many have had a major impact on the nation’s cultural, political and social life. All are remarkable and inspiring people who have reached a stage in their lives where they can look back and reflect. Through revealing in-depth interviews, they share their stories – of beginnings and challenges, landmarks and turning points. In so doing, they provide us with an invaluable archival record and a unique perspective on the roads we, as a country, have travelled. Australian Biography Series 1 is a Film Australia National Interest Program. As part of Australia’s involvement in World War I, in 1915 Australian troops landed as part of an allied invasion force on the Gallipoli peninsula, in Turkey. The aim was for the troops to move overland to the Turkish capital, Constantinople (now Istanbul) and defeat the Turkish forces. This would have taken Turkey out of the war and allowed the Allies to support Russia against Germany. The landing was at dawn on 25 April, and the Australians and New Zealanders landed at a place they named Anzac Cove. The Turkish forces resisted the invasion and the Allied troops were not able to progress over the Gallipoli peninsula. In December the Australians were withdrawn. Though Gallipoli was a military defeat, Australians believed that their troops had shown tremendous skill and courage, and that Australia had proven itself worthy as a nation. April 25 is celebrated each year as one of Australia’s most important national days. On the internet site where this clip is found Jack Hazlitt is descibed as a daredevil and the ‘archetypal Australian of a past era’. Is there any evidence in the film clip to support this description? What aspect of the fighting does Jack Hazlitt describe? Some people argue that a soldier who has lived through the horror of war cannot or will not explain those experiences, but must ‘sanitise’ them to stay sane. Do you get any impression that Jack is producing a version of his memories that sanitises or moderates the reality? Explain why or why not. Jack Hazlitt died in 1993 at age 96. How valuable are such filmed interviews as a tool for historians? If you had been the interviewer wanting to know more about Gallipoli and the experiences of diggers what extra questions would you have liked to ask Jack Hazlitt. Alistair Thomson, Anzac Memories, Oxford University Press, Australia, 1995.